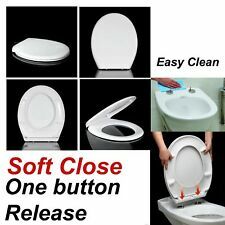 Automatic Toilet Seat Touchless Open Close Hygienic Motion Sensor Auto Opening Closing. This seat makes your bathroom experience even more hygienic. The adjustable infra-red sensor detects when you are approaching the seat and opens the lid, and another swipe of the hand over the sensor lifts the seat up. TAVOLETTA COPRI WC. COPPIA CERNIERE CROMATE DI RICAMBIO PER. 1 CERNIERA SINISTRA. 1 CERNIERA DESTRA. Ikea Tossig Unisex Toddler Toilet Training Seat and step stool White And Green. Excellent condition used for around 6 months. I have 2 lots available. Any questions feel free to ask. Thanks for looking. 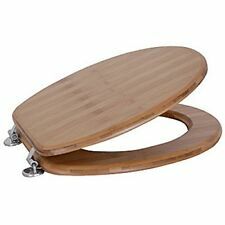 This BEMIS Elongated Closed Front Toilet Seat features a stylish molded wood design for an attractive look in your bathroom. Simply twist the hinges and remove. 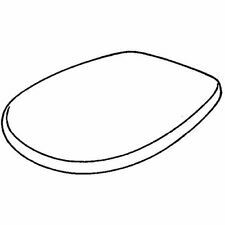 Fits all manufacturers' elongated bowls. Mit diesem erhöhten Toilettensitz mit Handlauf präsentiert Active Living eine sinnvolle Unterstützung für Senioren und alle Menschen mit körperlicher Einschränkung. Der Sitz bringt eine Erhöhung von 10 cm, ist aus glattem Kunststoff gefertigt, leicht zu reinigen und verfügt über rutschfeste Griffe. Er passt auf die meisten handelsüblichen WCs und ist einfach zu montieren. Zur Anpassung wird kein Werkzeug gebraucht. Die gepolsterten Griffe bestehen aus rostfreiem Aluminium und sind robust und dennoch leichtgewichtig. Die Belastbarkeit des Sitzes beträgt 100 kg..
Brass Gold effect toilet seat hinges for wooden toilet seats. 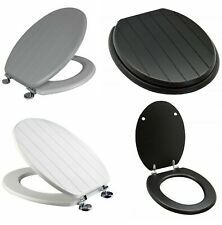 Adjustable to fit most standard wooden toilet seats. 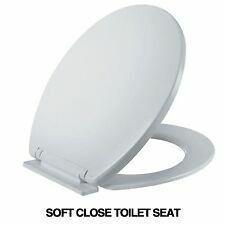 Steady Seat fixes loose / wobbly toilet seats easily and quickly. Toilet seats have an inherent design flaw: they work loose & wobble. Steady Seat fixes that quickly and easily, even if you are only as "good" at DIY as we are! Make toilet training extra fun with this Blaze and the Monster Machines Toilet Adaptor. Contains : Blaze & The Monster Machines Toilet Training Seat. Soft Cushioned padding to make your little one extra comfy while learning to use the toilet. 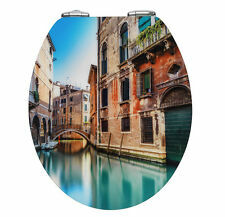 The Carrara Matta STA-TITE toilet seat is designed for universal pans. This seat features STA-TITE: the patented fixing system that always stays tight and takes the guesswork out of installation. The lower portion of the nut shears off when the proper tightness is reached, so you cannot over-tighten. 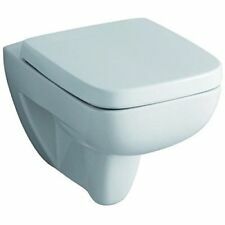 Features a gentle soft closing action seat and lid, top and bottom fix fittings and a button release for easy lift off. The seat also has anti-bacterial properties making it a more sterile and hygienic than standard seats. Easy to use, and highly effective in aligning the colon for effortless elimination. What's included : 1 x Eco Toilet Stool. Easy to clean, fits any toilet. Colour: White. STAINLESS STEEL TOP OR BOTTOM FIX TOILET SEAT FITTINGS. FOR USE WITH QUICK RELEASE TOILET SEATS. ROD THICKNESS (GOES INTO SEAT HOLES) 6MM. ROD HEIGHT 34MM. White Colour. Durable Strong Plastic Material. New! 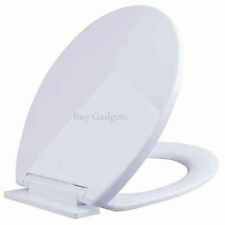 Bemis Toilet Seat 1955c White *Fast Shipping* Warranty!